Marine Projects | JDH Corrosion Consultants, Inc.JDH Corrosion Consultants, Inc. Designed corrosion control measures for 600 feet of retaining wall for holes 9 and 10. Retaining wall consisted of steel piles, helical tieback anchors and reinforced concrete slabs. The wall required a 50 year design life. Our services included preparation of a cathodic protection design for the helical tieback anchors and review of corrosion control measures for the concrete mix design. 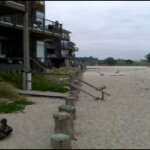 Conducted a condition assessment of the old retaining wall that the Pelican Point Sea Wall replaced. A corrosion rate was determined which was unacceptable for the design life of the new wall. 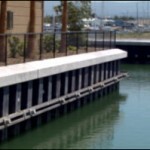 The new sea wall consists of W18x45 structural piles, steel tieback anchors and concrete slabs. An outcome from the condition assessment was that our firm was retained to designed corrosion control for the new sea wall. Corrosion control considerations included, cathodic protection, materials selection for the piles, coating systems and concrete type and cover. This design life was for a minimum of 50 years. Designed a cathodic protection system for 2200-ft. of 40-ft. high enter-locking steel sheet pile retaining wall for the new Bair Island Marina. This system utilizes six rectifiers energizing 36 semi-deep anode beds for the impressed current cathodic protection system. Permanent zinc reference electrodes are also installed on the land side of the wall to permit evaluation of the degree of protection being afforded to the land side of the wall. Conducted a corrosion evaluation of the steel wave baffle protecting the marina adjacent to Pier 40 in San Francisco. Extensive non-destructive testing techniques were used to determine the corrosion rate and life expectancy for the wave baffle structure. Ultrasonic thickness measurements were made on the web and flange sections of the steel piles at HHW, splash zone, LLW and at the mud line. All measurements below the water line were made utilizing the services of a local diving company. The subject steel piles were constructed out of marine steel (i.e. copper bearing steel) and a corrosion rate and remaining useful life determinations were made for this structure. It was determined that a cathodic protection system was not needed in order to achieve the desired useful design life of this structure.